Below the Dewey Lake Redbeds and above the Salado Formation where the waste is buried, lies the Rustler Formation--the principal karstic aquifer in the area. The Rustler is divided into five layers,or members which are, in descending order: the Forty-Niner, the Magenta Dolomite, the Tamarisk, the Culebra Dolomite and the Unnamed Lower member. The Magenta and Culebra members are both persistent marker beds and reliable aquifers, and are saturated with water in every WIPP test well east of Nash Draw. Water also flows through the other members of the Rustler and in the interface between the bottom of the Rustler and the top of the Salado. The Culebra Dolomite is often described the most likely pathway for radionuclide migration to the Pecos River 12 miles away, but other members in the Rustler have also shown evidence of water flow as great or greater than that of the Culebra and both the Unnamed Lower member and the Rustler/Salado interface are closer to the repository. Certainly all the members of the Rustler are water bearing in places and all are involved in groundwater transport. The Rustler Formation thins to the west, across the WIPP site because the salt (halite) in the formation is being dissolved away and other minerals are being altered. East of the WIPP site, where water has not eroded away the sedimentary rock in the Rustler, its members consist of alternating beds of anhydrite, halite and siltstone. Where there is moving groundwater, however, the anhydrite is changed to gypsum and the halite dissolves to mudstone. Moving west across the WIPP site, halite is missing from successively lower members of the Rustler. The Culebra Dolomite member of the Rustler has gypsum filled fractures throughout which are leached out from east to west. When this gypsum is glassy (selenite), this is proof that it has evolved by dissolution and groundwater flow. The partially open fractures in the Culebra are the main reason for the ease of water flow in that member. Unfortunately, DOE has not done the slant boring necessary to adequately characterize these vertical fractures. The groundwater geochemistry of the Culebra also demonstrates the same pattern. DOE models the Culebra as a 'confined' aquifer meaning that it receives virtually no rainwater recharge through the formations above it. If this were true, however, the water in the Culebra would be saturated with salts or almost so. In fact, the total dissolved solids (TDS) in Culebra groundwater within the WIPP site vary by a factor of 25 between two wells only a little more than a mile and a half apart. 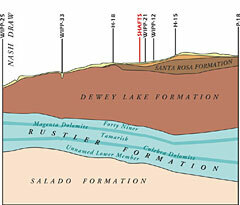 Where the Santa Rosa sandstone is present and water is not found in the Dewey Lake Redbeds, TDS are high. This is in the northeastern part of the site. TDS decrease as you go to the southwest where the Santa Rosa is gone and there is water in the Dewey Lake Redbeds. Culebra groundwater is being mixed with increasing amounts of fresh water from above as it moves west because the area is increasingly karstic. The Magenta Dolomite also shows evidence of karst. Test wells have found water-filled caverns, a shattered structure and in places faster potential flowtimes than in the Culebra. There isn't enough data, however, to model the Magenta as a potential migration pathway. 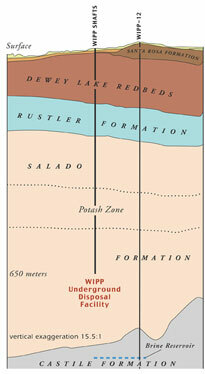 The WIPP repository sits almost half a mile (2150 feet) underground in the Salado Formation. This salt formation was left over when the ocean evaporated millions of years ago. Some of this ancient ocean survived, mingled with the salt crystals or in pockets and reservoirs deep underground. The salt in which WIPP is excavated is not completely pure but is 'bedded' salt--salt that is periodically interrupted by beds or layers of clay and anhydrite. These layers, called interbeds or sometimes marker beds, are continuous layers that run across the entire Delaware Basin for tens--or sometimes hundreds--of miles, connecting every borehole and all the shafts at WIPP that are drilled through them. Fluids can flow through these marker beds about 1000 times more easily than they can through the salt in the Salado Formation. So the flow of fluids in the Salado is controlled not by salt but instead by salt mixed with clay, clay layers and fractured anhydrite layers. Open fractures in the marker beds and openings where the anhydrite and clay meet the salt can allow the water or brine to flow even faster. If contamination from the repository reached one of these interbeds, it could be carried more easily to the outside environment. Marker Bed 138 is 20 feet above the repository roof and Marker Bed 139 is 5 feet below the floor. (Actually, now, the floor has been milled virtually all the way down to Marker Bed 139 in some areas of the repository.) There are other, smaller, interbeds inbetween. Once the repository is connected to these marker beds, it too is connected to every borehole and shaft in the basin. WIPP-33 and WIPP-14 are two test boreholes that were drilled into sinkholes near or at the WIPP site. These 2 sinkholes were given attention when the 1983 WIPP site gravity survey found negative gravity anomalies in these areas. Unfortunately, the boreholes were never turned into test wells even though the authors of the survey said the anomalies were the result of karst conduits. As described above, each of these sinkholes is a member of chains of sinkholes which lie both to the west and the northeast of WIPP. WIPP-14 is one of about 10 sinkholes which curve around the northeast boundary of the site. WIPP-14 itself is actually right on the site boundary. The WIPP-14 depression is of interest because it gives evidence of karst far to the east of where DOE describes the dissolution front. The authors of the 1976 WIPP site resistivity survey described the depression at WIPP-14 as a "...sinkhole due to solution caverning." (Underground caverns that have been dissolved away by water movement are typical karst features.) In addition, mudfilled channels were found here in the Unnamed Lower member and a 71 foot section of mud and fragments of gypsum and anhydrite were found below the Culebra Dolomite, indicating a former flow channel. 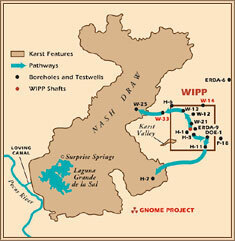 DOE now says there is no evidence of karst at WIPP-14. WIPP-33, one half mile west of the WIPP site, is the westernmost of 4 sinkholes. The easternmost of these is only 1000 feet from the WIPP site boundary. Five water-filled channels were found at WIPP-33 in the Magenta Dolomite and higher layers, and the depression showed low resistivity during the 1976 survey (as did WIPP-14). At WIPP-33, there is no salt left in the Rustler and all the anhydrite has been converted to gypsum. This is clear evidence that water has flowed through this area and even the DOE admits that these are karstic structures. However, they claim that WIPP-33 is only a finger of dissolution that extends out from Nash Draw and that the site is still behind the dissolution line. DOE has refused to turn the boreholes at WIPP-14 and WIPP-33 into test wells. In fact, WIPP-33 is part of a flowpath that could move contaminants quickly off site and into the accessible environment. There are two of these flowpaths at WIPP. The first flow path runs northwesterly from the WIPP exhaust shaft to borehole WIPP-13, to borehole WIPP-33 and to borehole WIPP-25 in Nash Draw. The second path runs southwesterly from test well H-3, to test well DOE-1, to test well H-11, and to test well H-7 (also in Nash Draw). Hydrologic testing has found hydraulic connections and zones of fast transport along these two pathways. The southwestern flow path from H-3 to DOE-1 to H11 is primarily through the Culebra and the Unnamed Lower member. It should be noted that test well H-3 is only 400 feet south of the waste panels. Cavernous 'washout zones,' where dissolution residue was washed away during excavation, were found in the Waste Handling Shaft just below the Culebra Dolomite (see photo on left). DOE has only modeled this pathway as far as the WIPP site boundary and unfortunately, has done very little study in general of the Unnamed Lower member. In the northern part of the site, a multiwell pump test was done at WIPP-13, but all the monitoring wells were in the Culebra even though evidence indicates that the northwestern pathway is actually in the Magenta and higher strata. (That is where the water-filled caverns were found at WIPP-33.) Even so, testing showed that at test well H-3 transmissivity (the ability for fluids to move easily through a formation) in the Magenta is more than 17 times what it is in the Culebra; at WIPP-25 transmissivity in the Magenta is 1.4 time that in the Culebra. Unfortunately, there is little data on the Magenta and further testing needs to be done to define the locations of the karst conduits there. It is characteristic of karst hydrology that after flowing underground through dissolution caverns and conduits, water emerges at the surface again at a few, large springs. Near WIPP these discharge points are the brine springs at Malaga Bend on the Pecos River and Laguna Grande de la Sal in Nash Draw. Almost 1000 tons of salts are discharged every day into the Pecos River near Malaga Bend; groundwater discharge to Laguna Grande is about 9 times that. Laguna Grande is where contaminated brine escaping from WIPP would reach the accessible environment. The WIPP site lies within the Nash Draw drainage basin and the lowest point in the basin is Laguna Grande. The karst springs that drain the Rustler Formation reach the surface at Laguna Pequena, the largest inlet to Laguna Grande. Under karst conditions, contaminants can travel at the speed of flowing water. Under optimum conditions travel times could be as short as ten years from the WIPP repository to Laguna Grande. Plutonium and other heavy metals would concentrate in the lake sediments until they were flushed out by major flooding onto the land and into the Loving Canal, an irrigation canal which connects to the Pecos River. Thus the waste at WIPP could travel to the Pecos River and from there to the Rio Grande. Even though DOE is burying waste at WIPP as you are reading this, it is obvious that they need to do more hydrological investigation at WIPP. Leonard Konikow of the United States Geological Survey (USGS) has said that if you do not know the water table, you do know know the hydrology of a site. DOE doesn't know the water table and many other facts about WIPP hydrology despite having spent millions of dollars studying the area. Too many times the statement has had to be made that there is not enough data to model a formation as a potential pathway. Currently DOE cannot characterize the site well enough to determine definitively whether or not karst exists right over the WIPP site. Too often boreholes are not turned into test wells or are not drilled in a way that would be most likely to find more evidence of karst. Most strata above the Salado have had very little investigation. Even the Culebra Dolomite which DOE believes is the most likely pathway for contaminants has never been slant-drilled--the only way to adequately study the vertical fractures in it. This lack of knowledge is probably not coincidental since DOE scientists who find evidence of karst at WIPP also find themselves looking for employment elsewhere. Reports and data favorable to karst disappear into the system and DOE continues to promote a geological theory that denies the possibility of karst at WIPP--a theory which no independent scientists support. Among other tests, WIPP-33 and WIPP-14 need to be turned into test wells and dye tracer tests need to be done along the most likely pathways to see truly how long it takes water to flow along these paths. DOE needs to make use of new technology which for relatively little money could give us a clear picture of karst structures over the site if they do, indeed, exist. The danger from the short travel times which could exist under karstic conditions is so great that this is an issue which cannot be ignored. Every 5 years DOE must prove to the Environmental Protection Agency that WIPP can still contain the waste for 10,000 years. The next review is in 2004. If the real geological picture of the site could be shown, it is still possible that the WIPP Project could be shut down.